Oh hey, long time no read, eh? Yes, a long hiatus IS long. But hey, my blog JUST entered its’ fifth year. I’ll ramble more AFTER finishing this review, which rather unique (quite apt in starting again my blog). Let’s start. 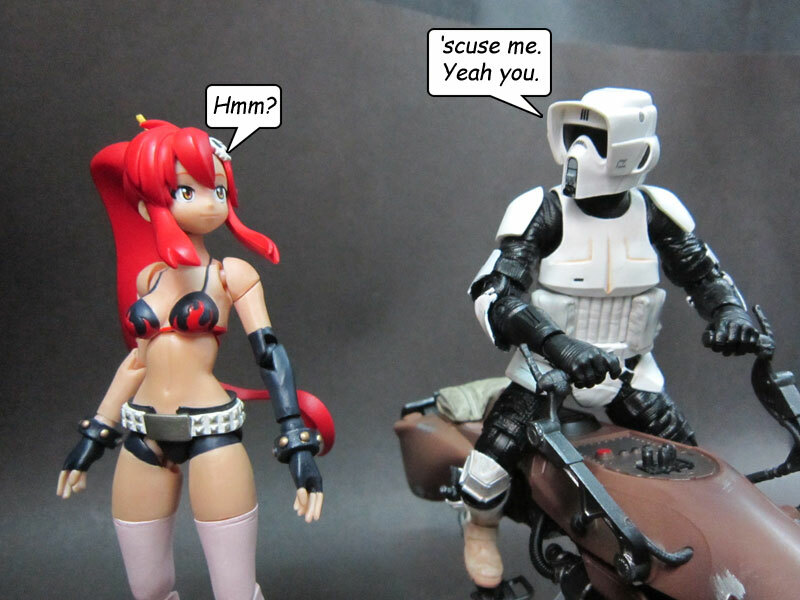 I mainly (or rather NEARLY) review figures from Japan-based companies, but not today. 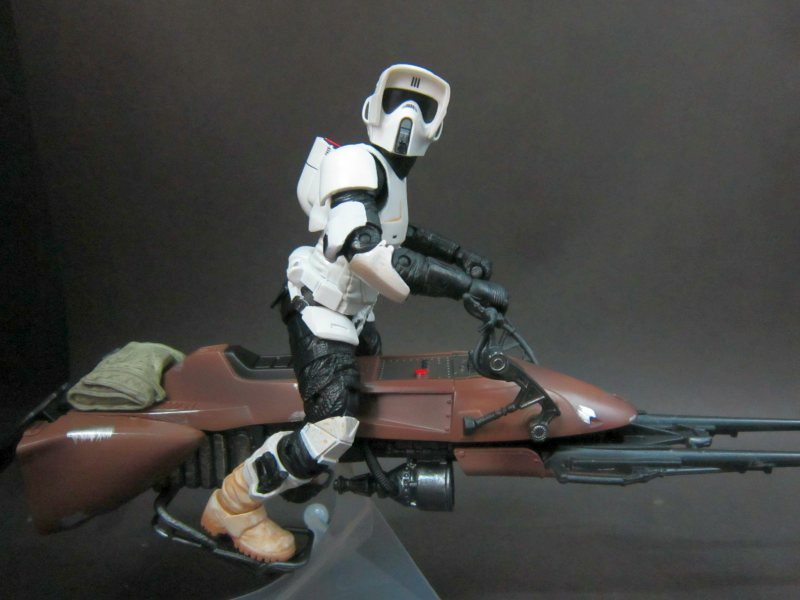 As this is a Hasbro Black Series 6″ Deluxe Imperial Scout Trooper figure, which also includes (a first for the 6″ series to have a vehicle/prop) a 74-Z speeder bike. 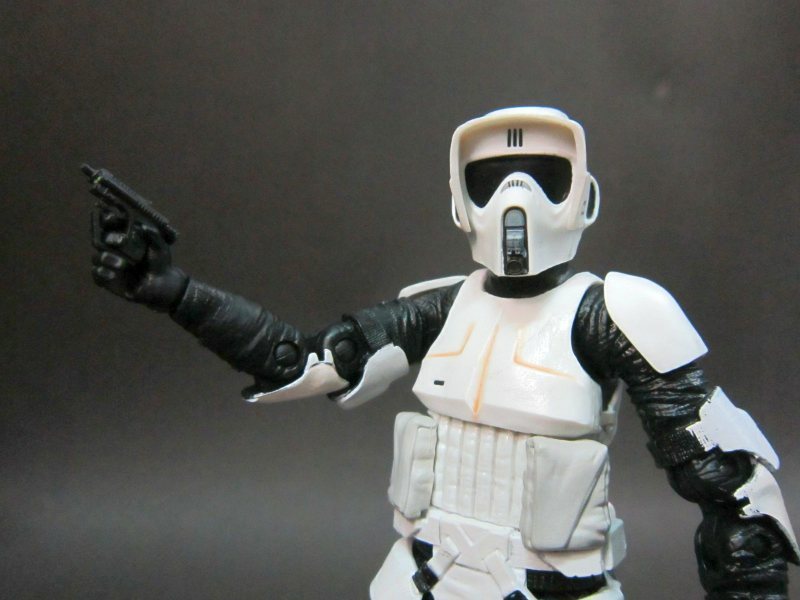 To be honest, I always wanted to get any trooper from the Black Series 6″ line, but very hard to come by (locally, as I opted to never buy things directly online) and LO AND BEHOLD! 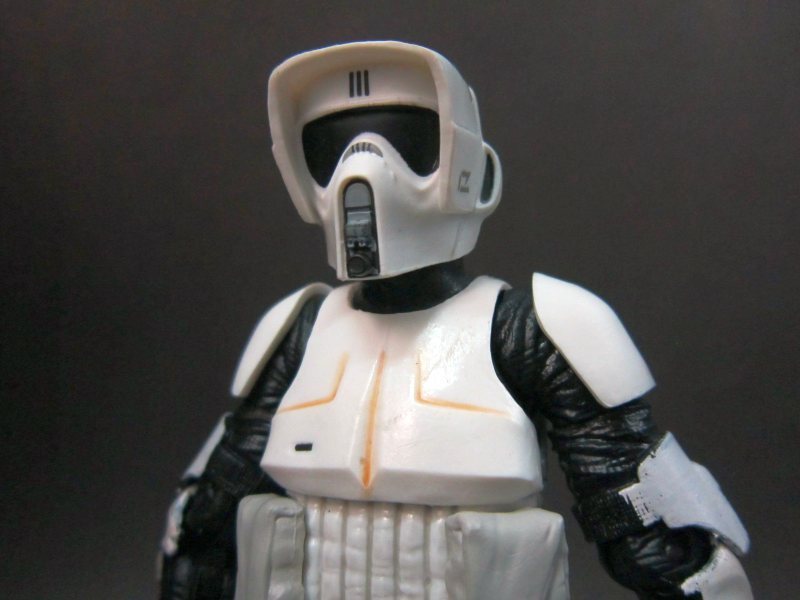 I have the fortune to set my eyes upon three boxes of the Scout Trooper figures at a local department store. Without hesitation, I bought one. Right off the bat, the figure is made from materials unlike any of the figures I have, as it uses a more pliable plastic/PVC. So its a little more “forgiving”, ish. 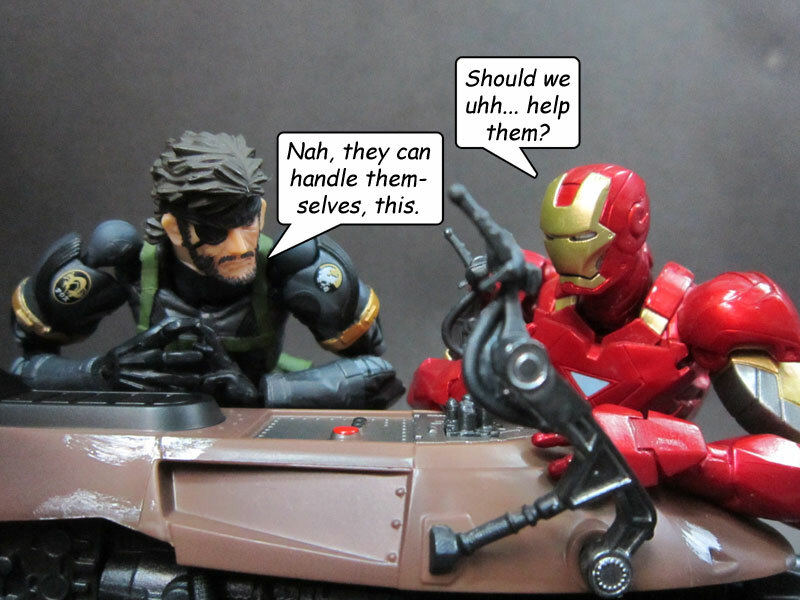 Its still a figure, so do handle with care. 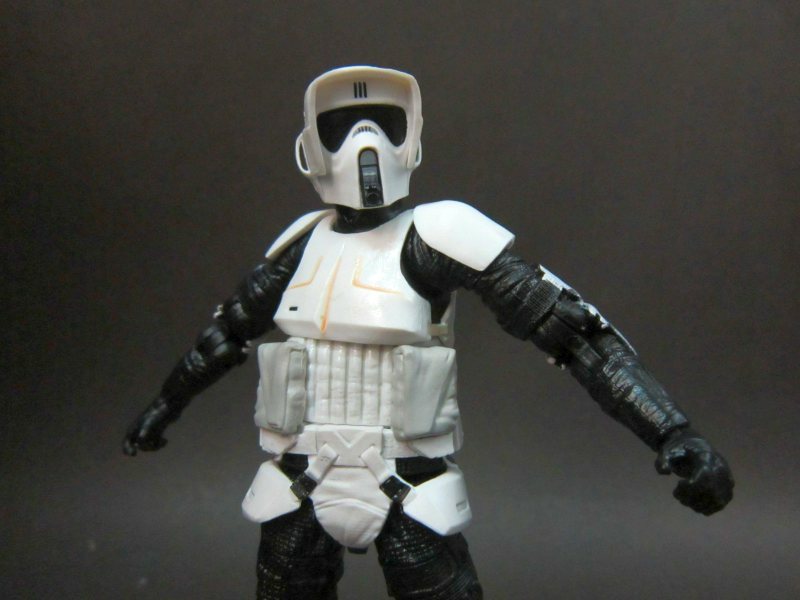 From the front, we see the figure captures the overall Scout Trooper detail very well, including minor sculpting details and insignias. 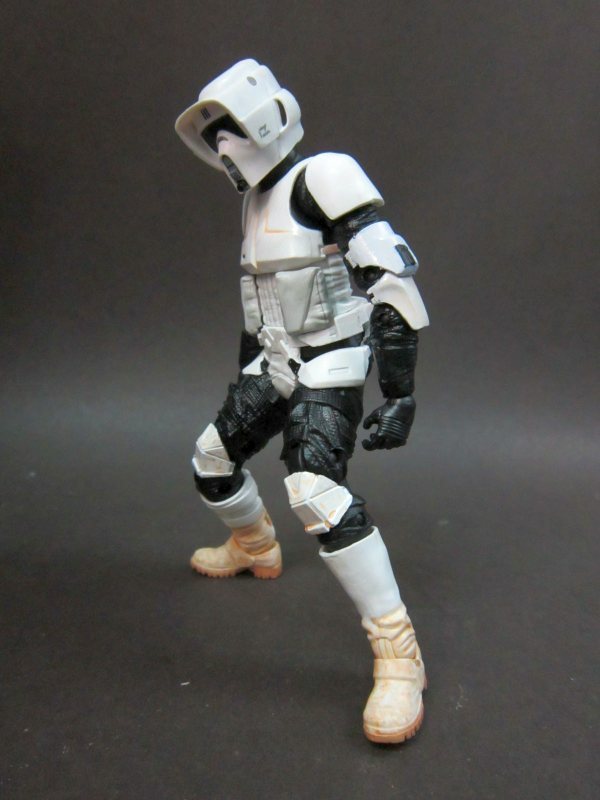 Overall, its a pretty good figure. Since this is my first one from Hasbro, so EVERYTHING is a first for me. Ahaha. 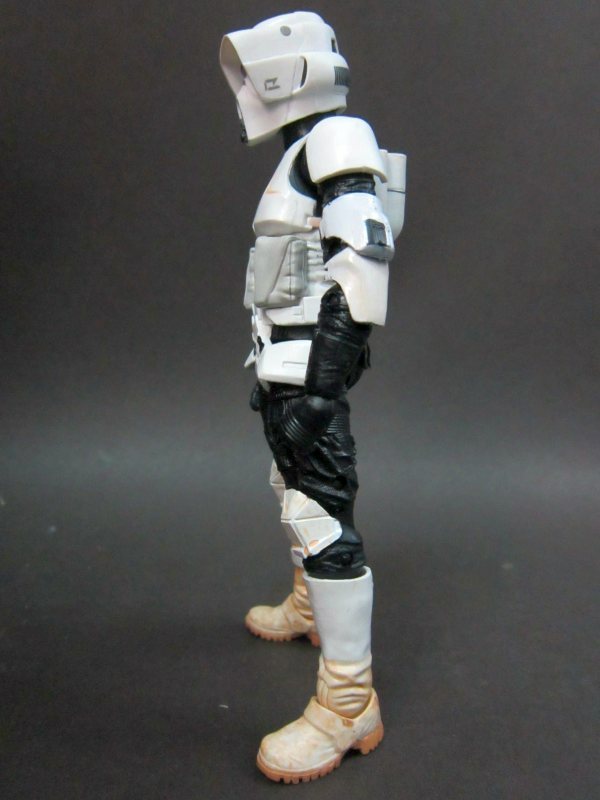 Now you will noticed the weathering detail on the boots, quite nice and shows that this guy been working outdoors a lot (unlike the mostly indoors Stormtrooper), BUT the transitioning from dirt to no dirt is very… jarring. Guessed they should’ve mind to level off the dirt gradient BEFORE hitting the masking tape. 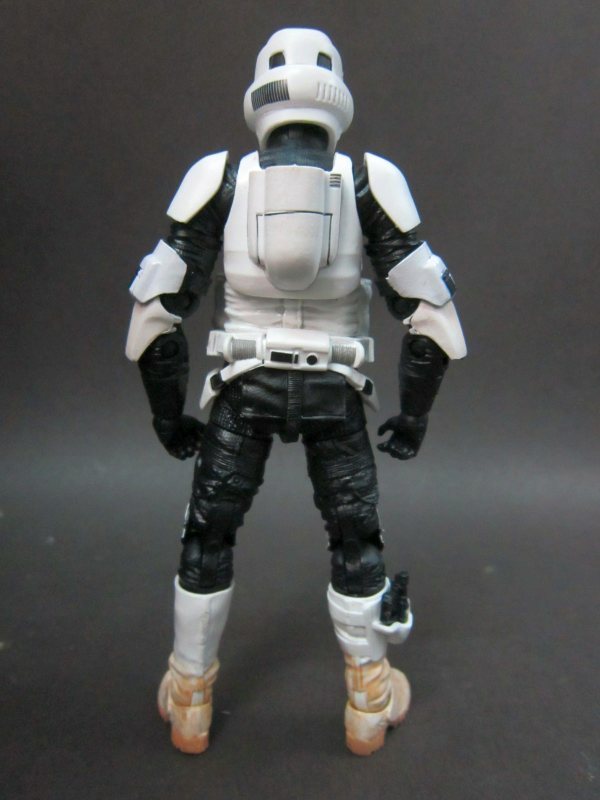 The back we can see the backpack (that contains many of his survival items), and thermal detonator (which has a longer handle compared to a normal Stormtrooper’s one). I noticed one thing from the rear view… he has a “healthier” waist. 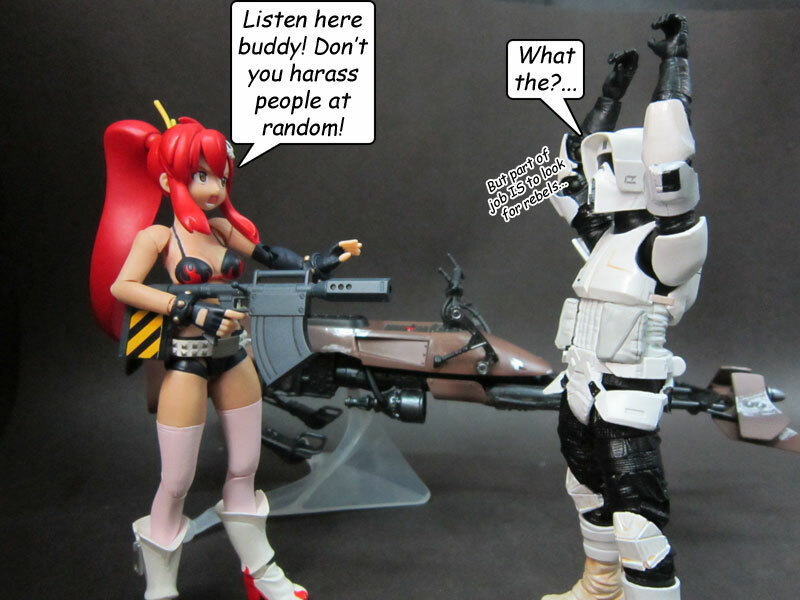 Roughcut: HEY! I HEARD THAT! 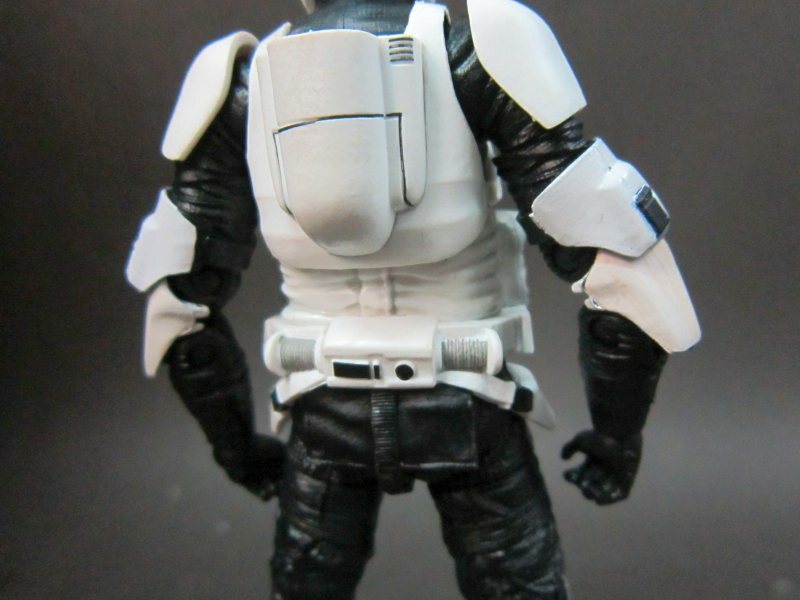 Here we see in more detail from the rear, and now I noticed that Scout Troopers has some extra padding on their behinds’ which, to be honest, I never saw that in the movies. 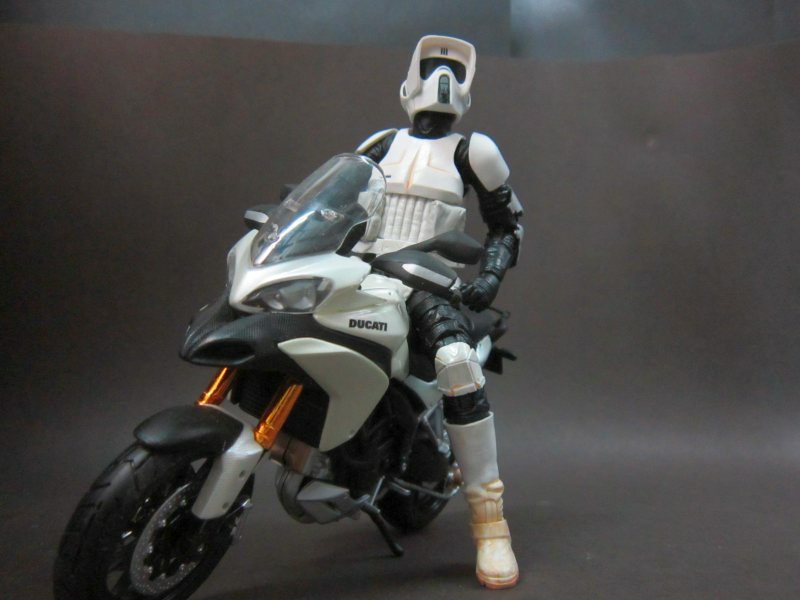 This provide some much needed comfort when you’re working most of the time riding a speeder bike for long durations. 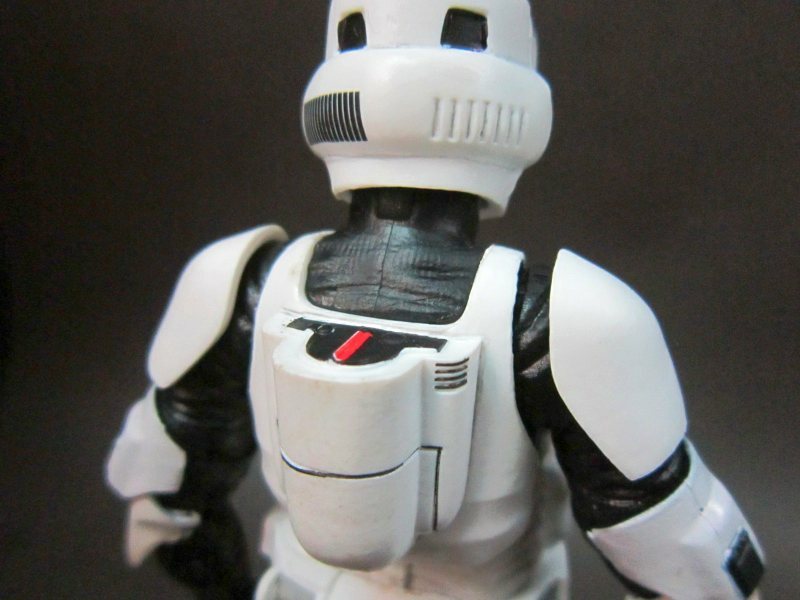 The indentations on the chest armour has some dirt/weathering to it and all the white armour parts are done in matte, unlike the actual armour in the movies, which are shiny. 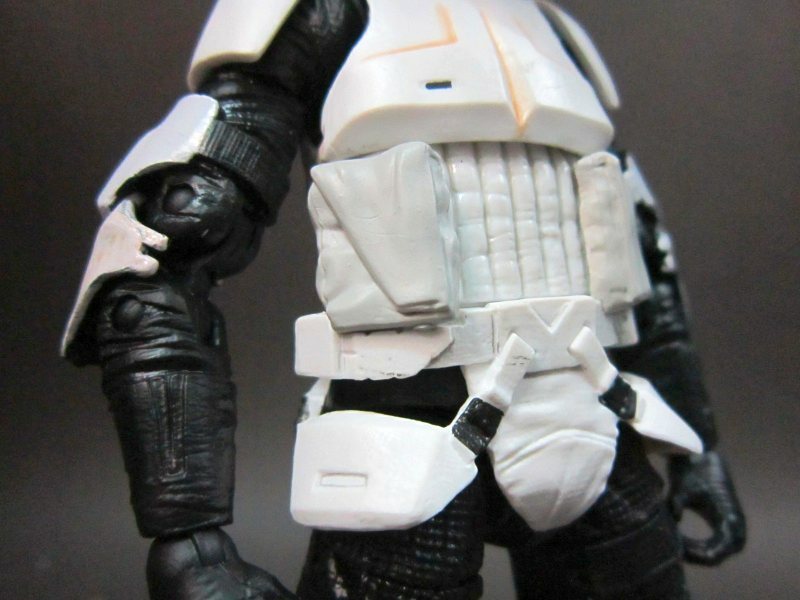 But then again, after watching the Black Series Storm Trooper review in Youtube, I found that all the white (so far) armour parts are done in matte. Probably due to the choice of materials used. 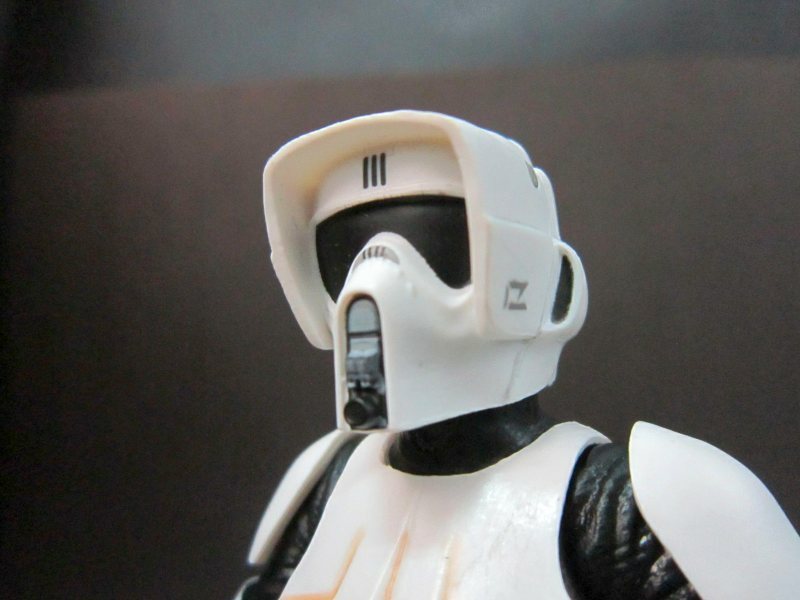 The helmet is really detail, the helmet’s mouthpiece’s speaker and filters are shown in good detail, the decals/insignia on the left side and above the visor is true to the film’s. Note, some parts of the figure I’ve used a pencil in tracing some of the (not-so visible) outlines. .You’ll instantly noticed that the elbows are double-joint, which gives the arms a good range of motion. Here also you can see his pouches on his waist. 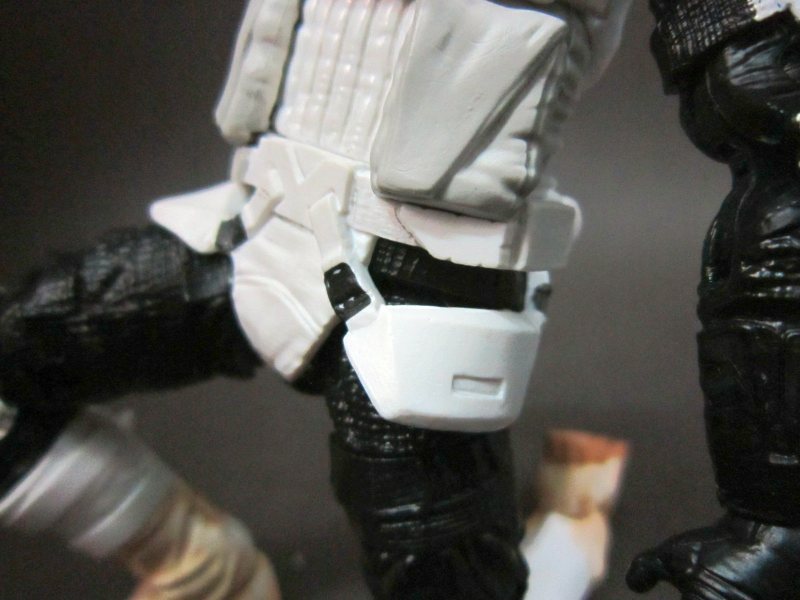 The buckle and side hip guards are detailed, BUT, due to the way the hip guards are attached to the waist, this hinders some hip movement. 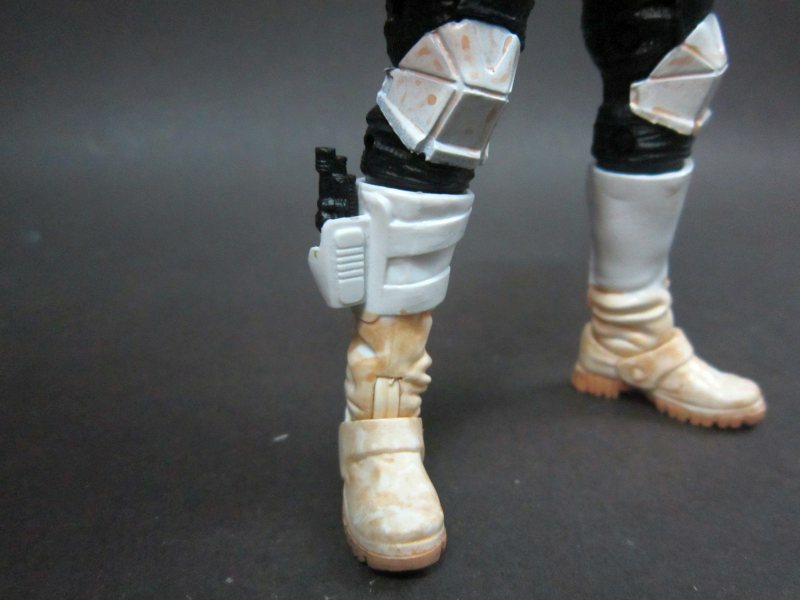 The knee pads are nicely detailed and yes, his right boot has a holster for his (puny) blaster pistol. 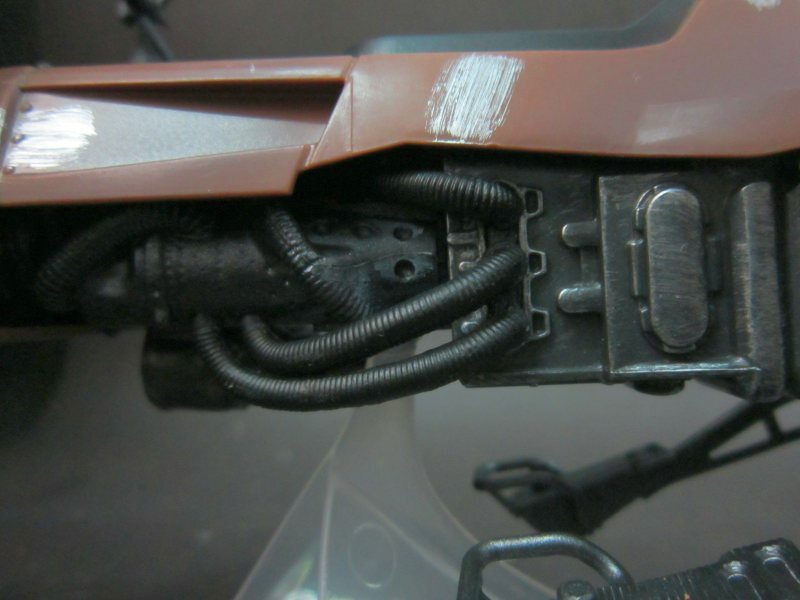 Here you can see the abruptness in weathering from the lower part of the boot to the upper. 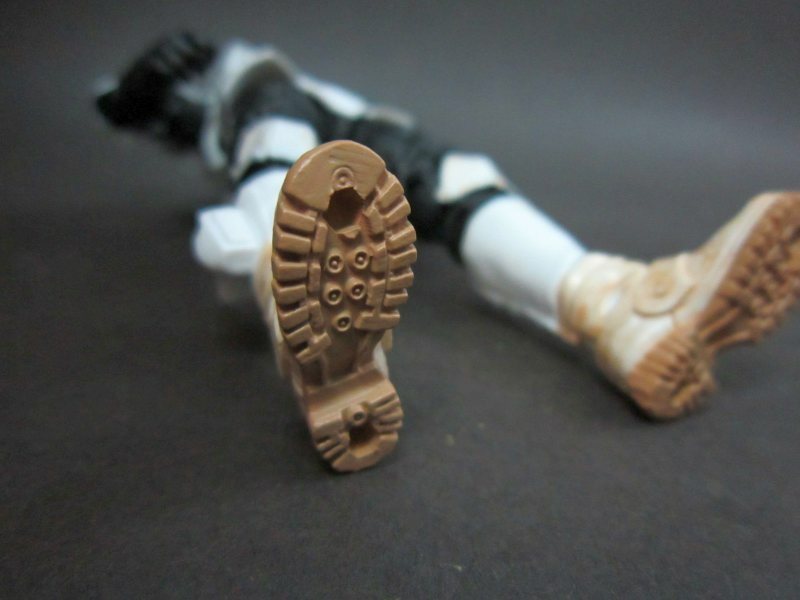 UNLIKE the Stormtrooper, the Scout Trooper’s boots soles has ACTUAL soles and additional socket to attach to his speeder. 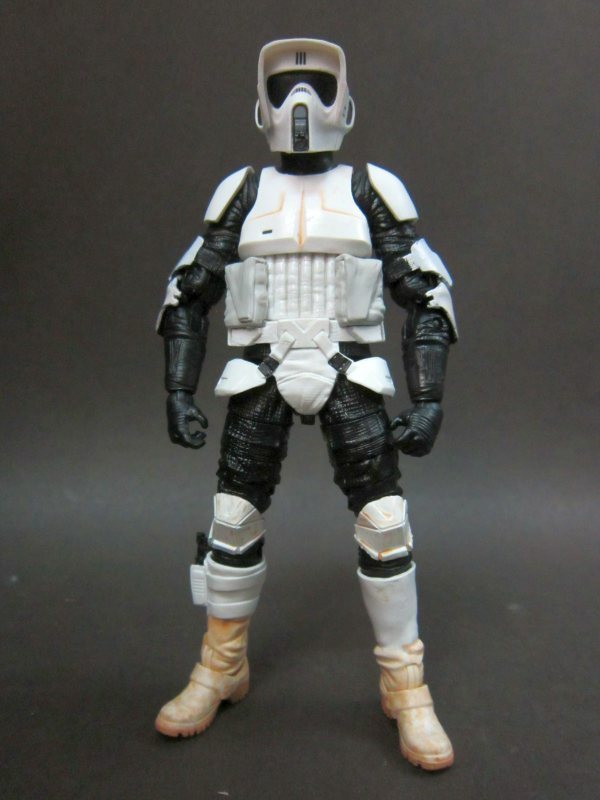 Okay… this IS a Deluxe figure from the Black Series, but… these sloppy paint jobs really kills it. 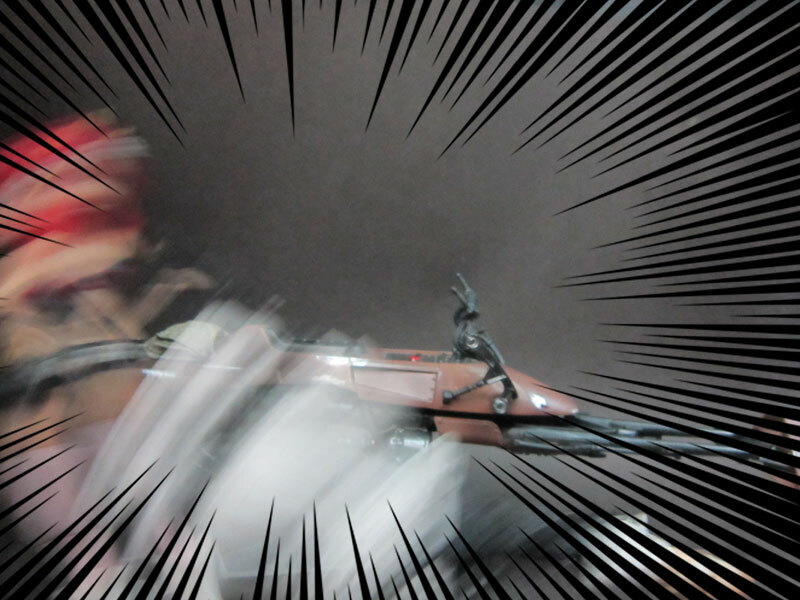 Since I’m also into gunpla/plamo stuff, I won’t rant much and will fix these issues myself. 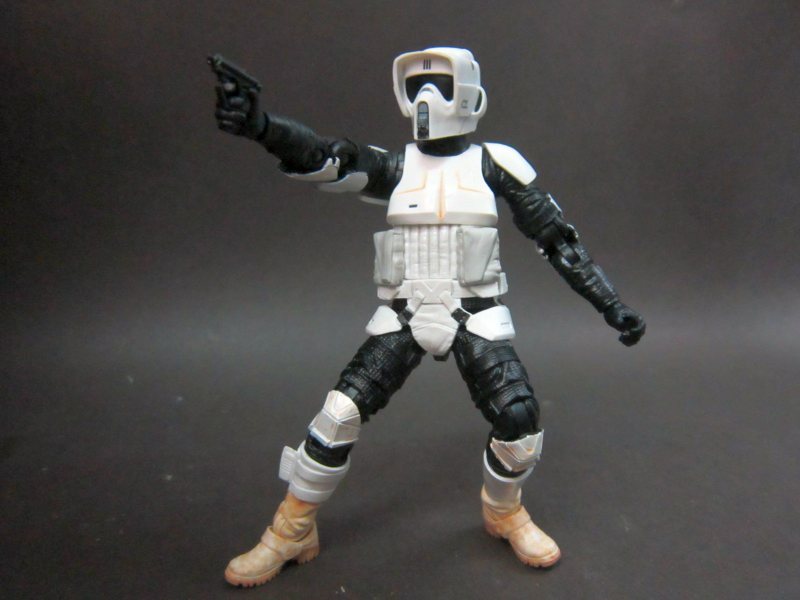 Other Youtube reviews of this figure shows the EXACT. SAME. PAINT JOB. ERRORS. 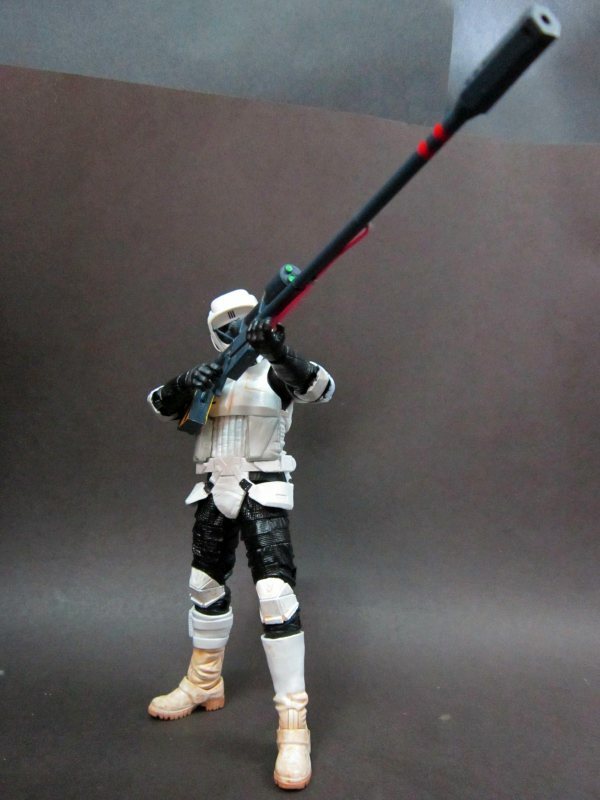 Hasbro, do step it up. Thanks. 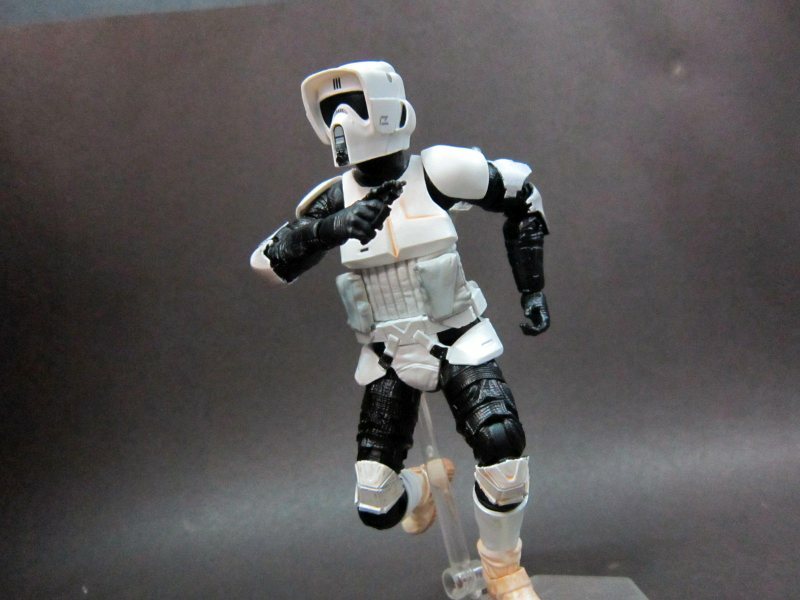 The torso has only a ball-joint that enables him to rotate side to side and give VERY little movement of front and back bending. And no, there is no joint on his waist. Which is rather sad. Be fixing the upper torso by sanding a bit the lower part of his torso armour later, so he can bend forward a bit more. Unlike the sadpanda-like torso, the legs are more dynamic. 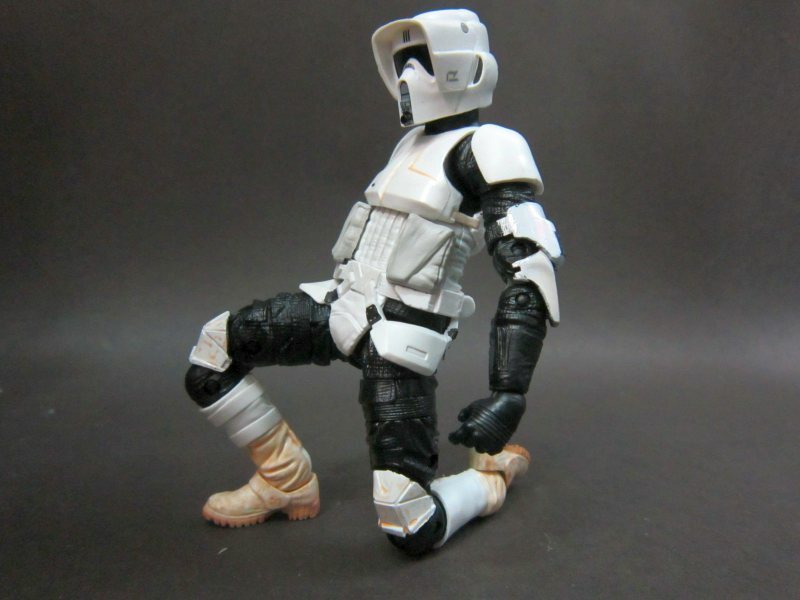 The knees are double-joint, the hips and shin has swivel-joint, and the ankle uses a tilt-joint and a rocker for the foot. 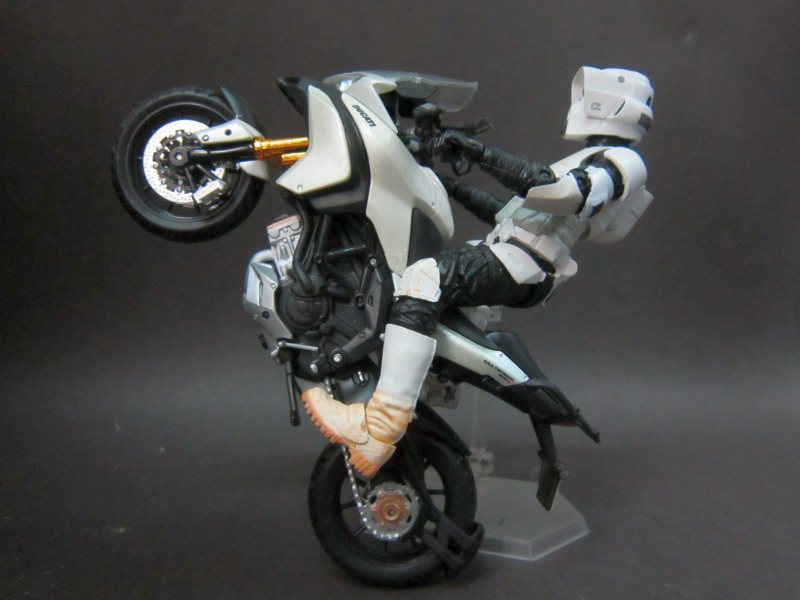 Sadly his hips can’t go any higher than this… And yes, I’m using a figma stand to help him stand as the figure only comes with a action-base/stand for the bike. 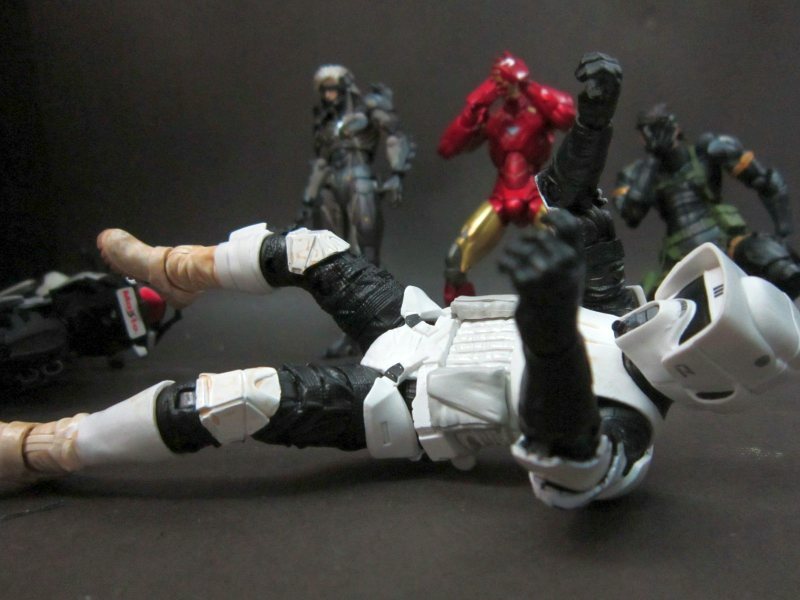 Due to the hindrance of the hip guards, kneeling can be an issue. But doable, anyway. This is why it has limited frontal hip movement… be looking for ways to remedy this in the future. This the ONLY weapon he has. 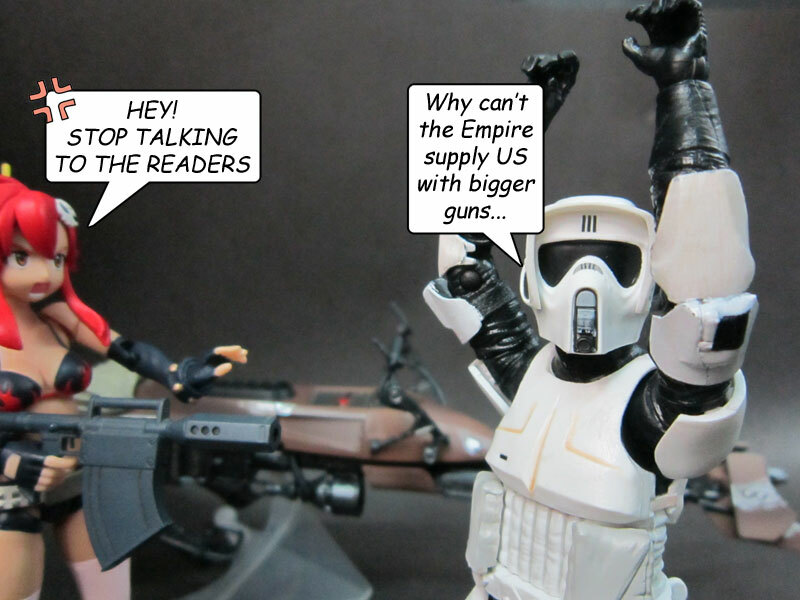 Note the trigger guard is EASILY snapped. Like mine did. And yes, other reviewers also suffered the same issue. 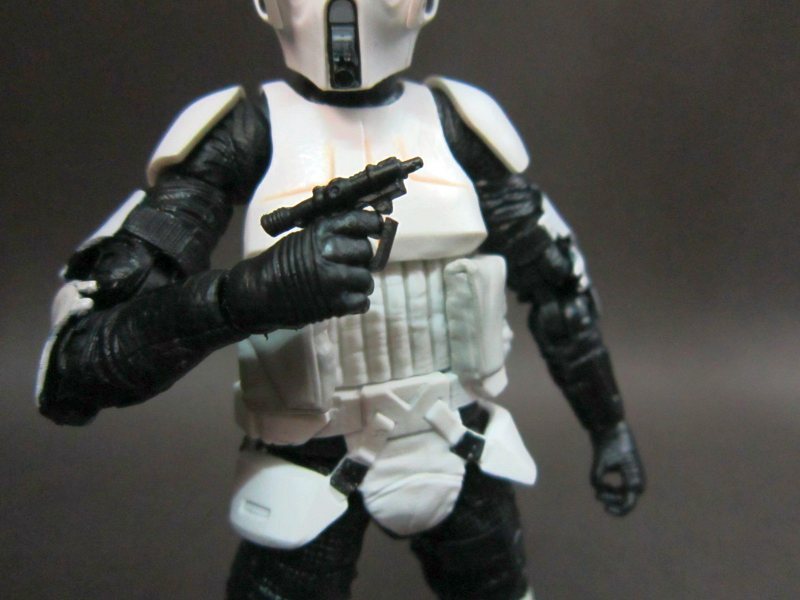 Also, the pistol doesn’t hold securely in it’s holster, solved that by putting a bit of bluetack inside it. 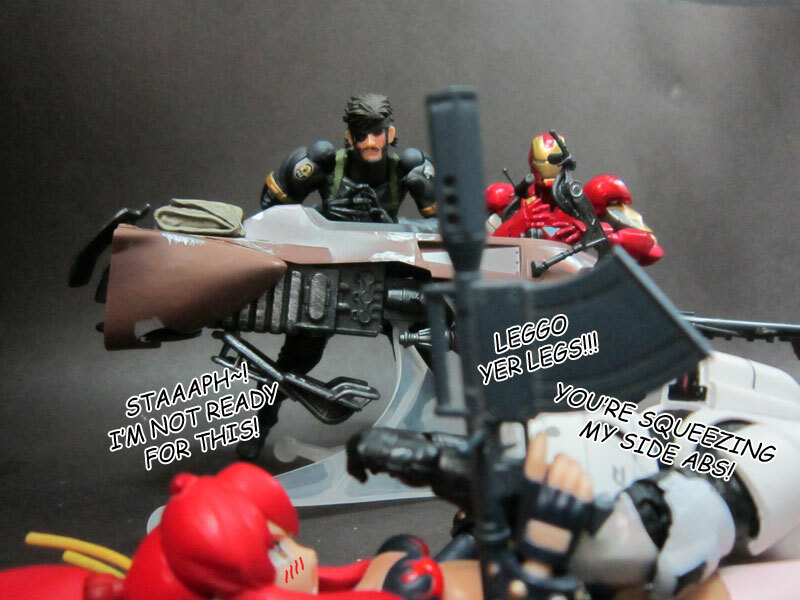 The range of articulation is not bad. Even with hindrances on the torso and hip. 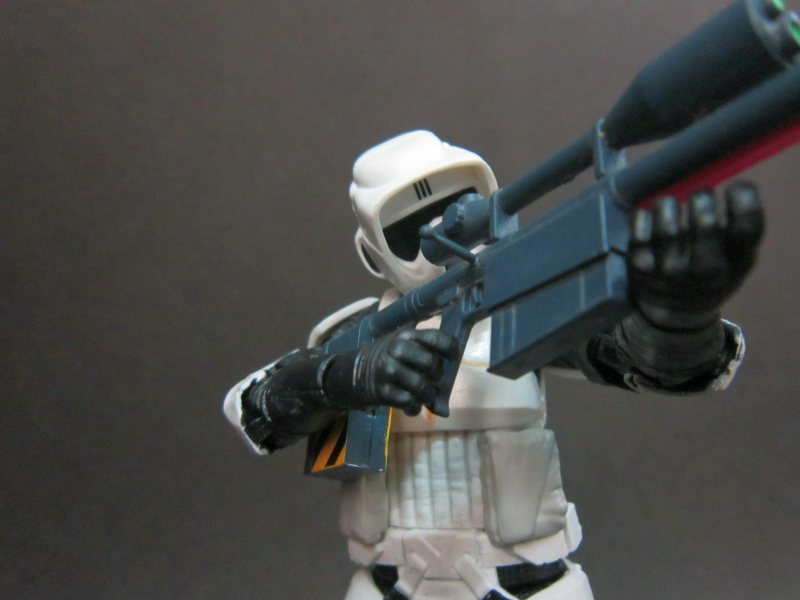 Roughcut: HUTT-SPIT! What a time to left my bike. 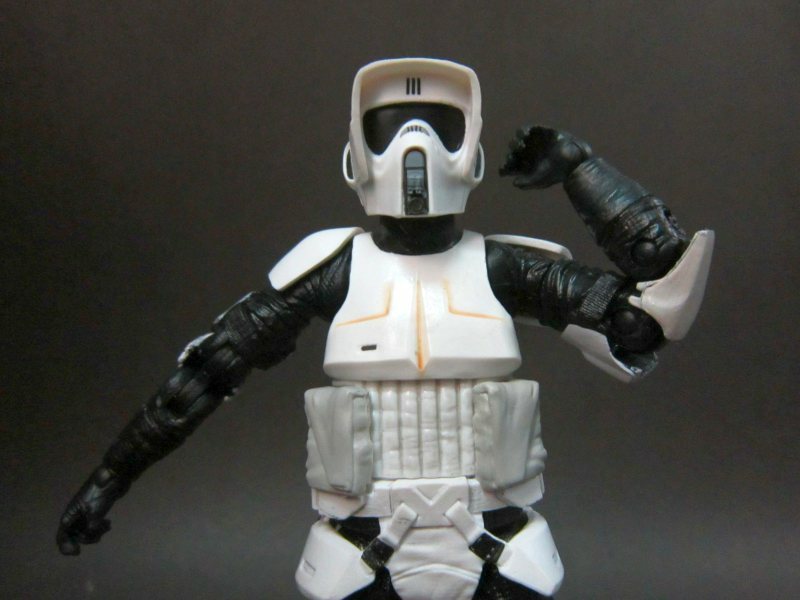 Some poses that requires better torso movement will looked rather… stiff. As in this case. Guessed he should have laid off the doughnuts last night. You DID asked for a bigger gun, right? 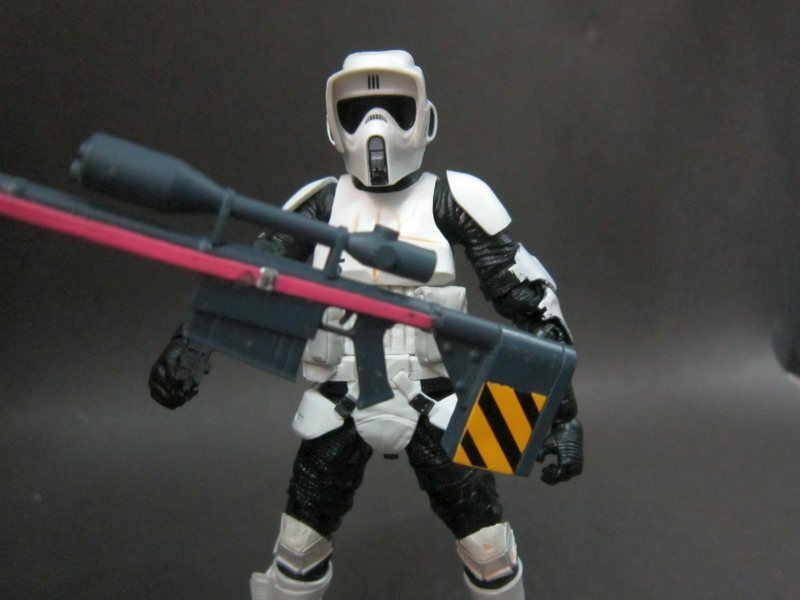 Roughcut: What the… PINK straps? C’mon… This looks lame. I wouldn’t say that if I were you. 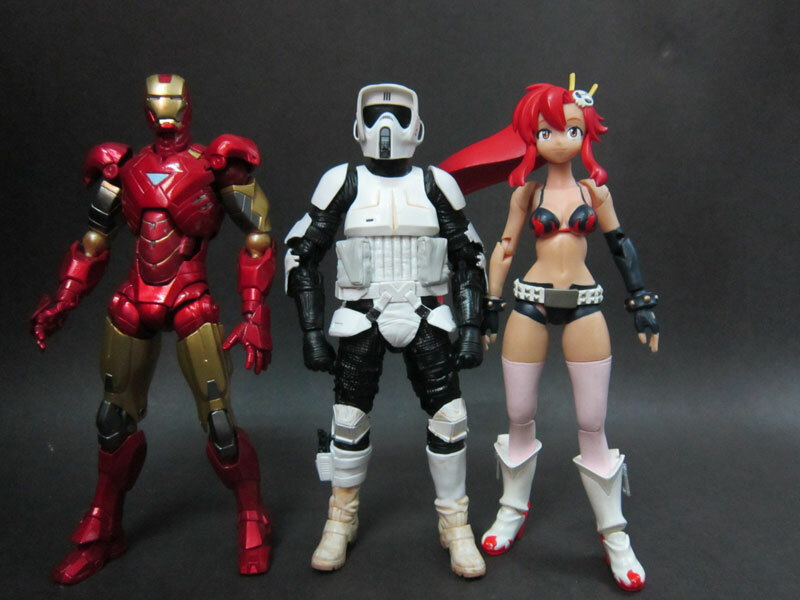 And yes, these 6″ figures are in-scale with Revoltech 6″ or 1/10 scale figures. 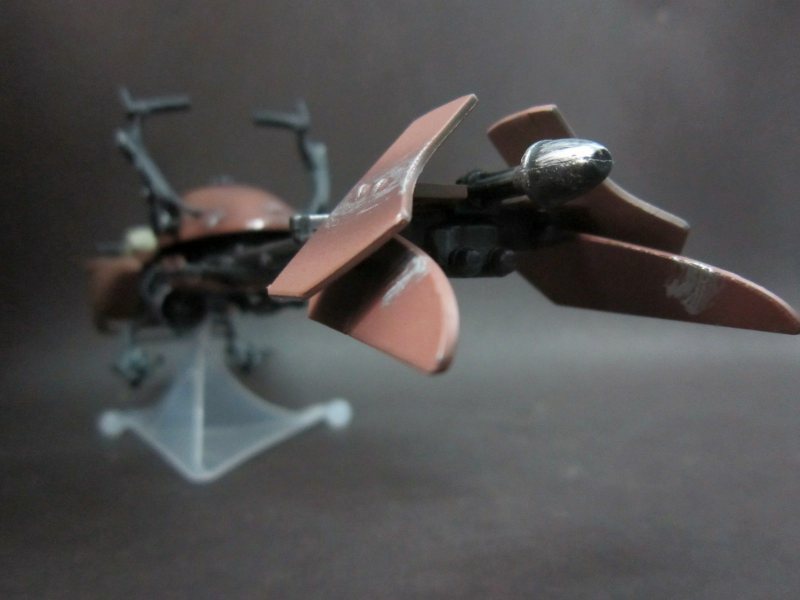 Roughcut: Not bad. Not bad at all. Yeah… I cheated a bit here. I don’t want to damage the hands now, okay. 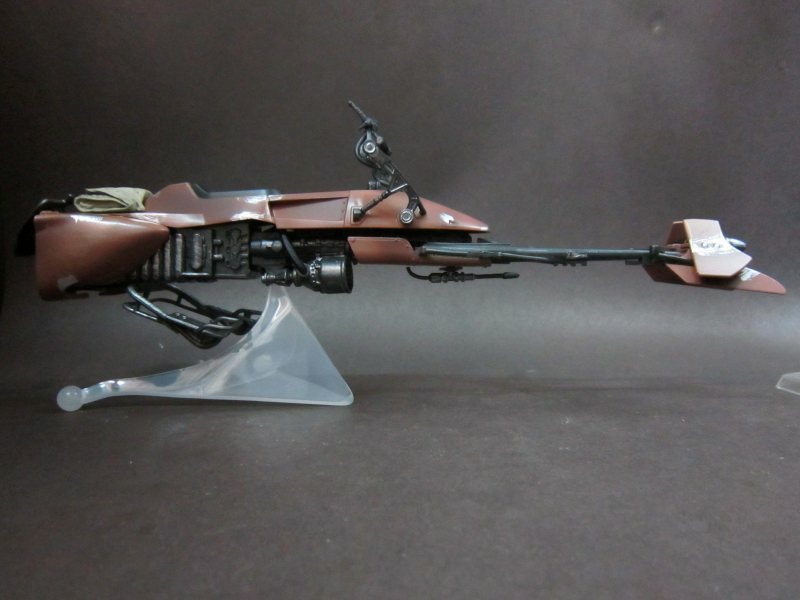 The first ever vehicle to be included for the 6″ Black Series. The bike is by far, very long. 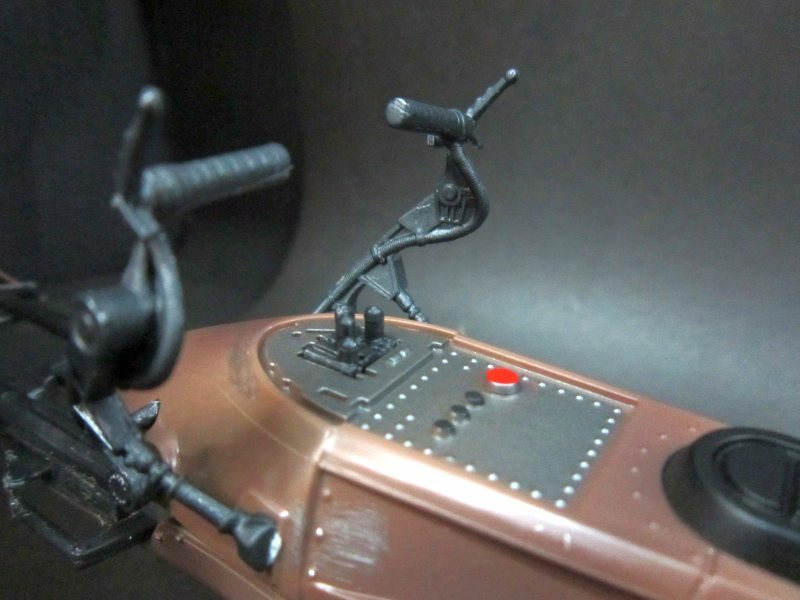 And the action base has three choices of heights, in the form of ball-joints. The detailing of the bike is very sharp, like this nose section. 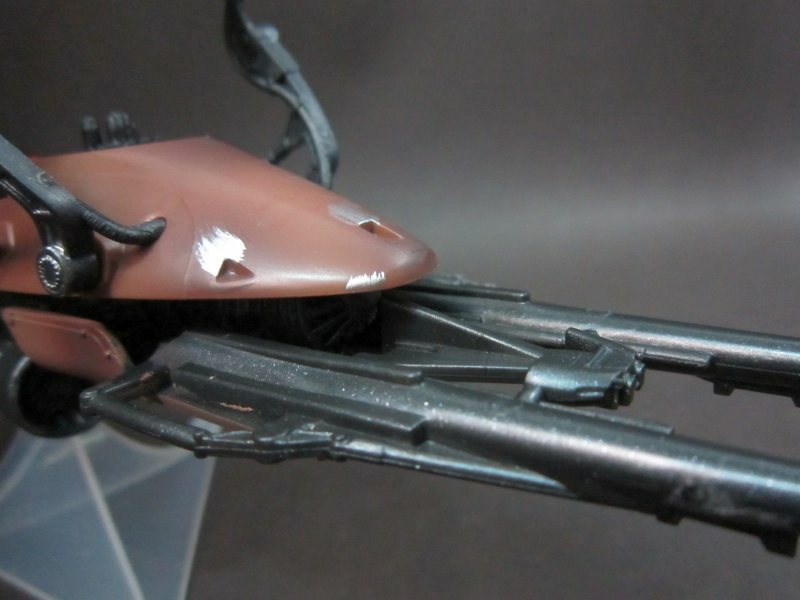 The ONLY issue is the WTF-like silver-smear/”weathering” effect on it’s body panels. 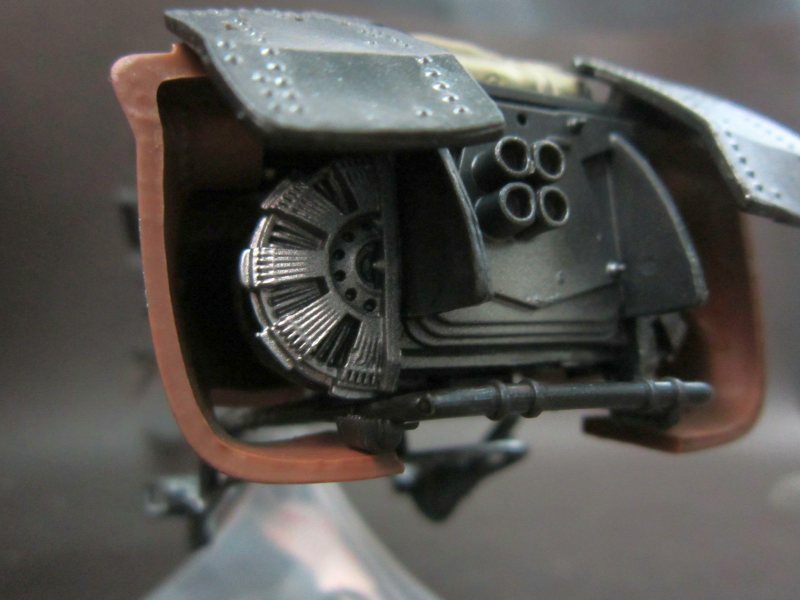 Now we get to see the workings of the 74-Z speeder bike in better detail, like this intake for example. 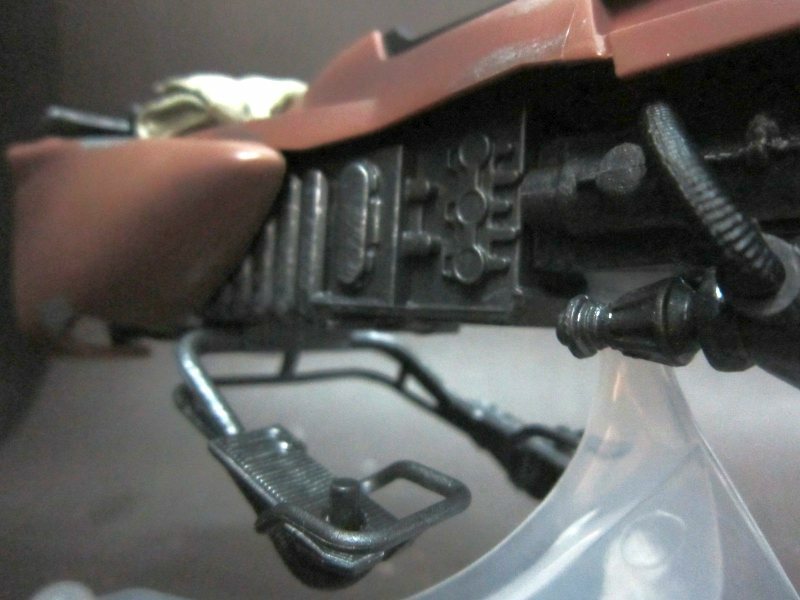 The engine part on the other hand, has nice silver dry-brushing effect. 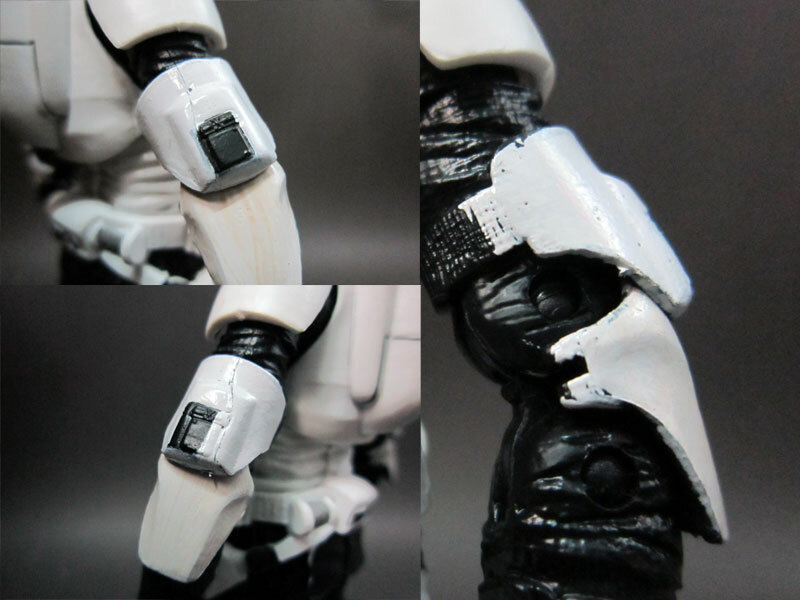 Here also you can see the pegs for the foot of the trooper, so he can ride it securely. 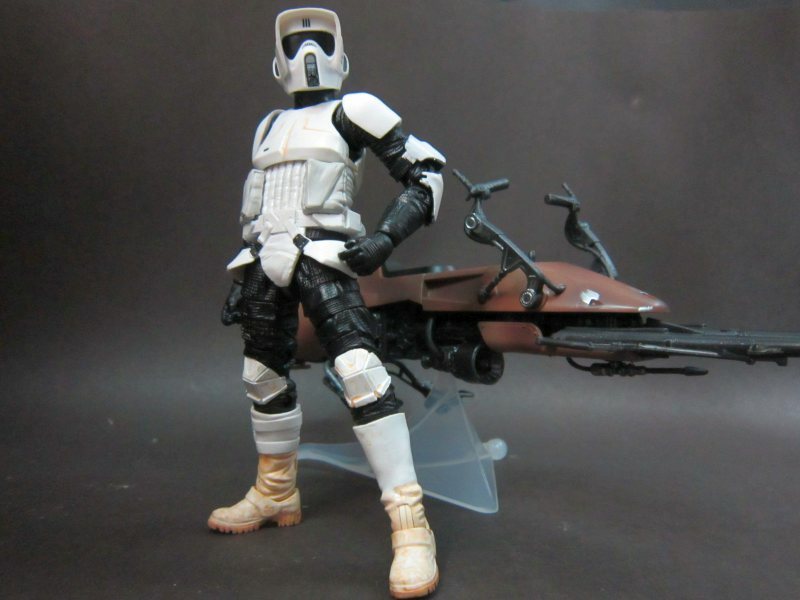 Just like in the movies, the blaster is present, and with details. 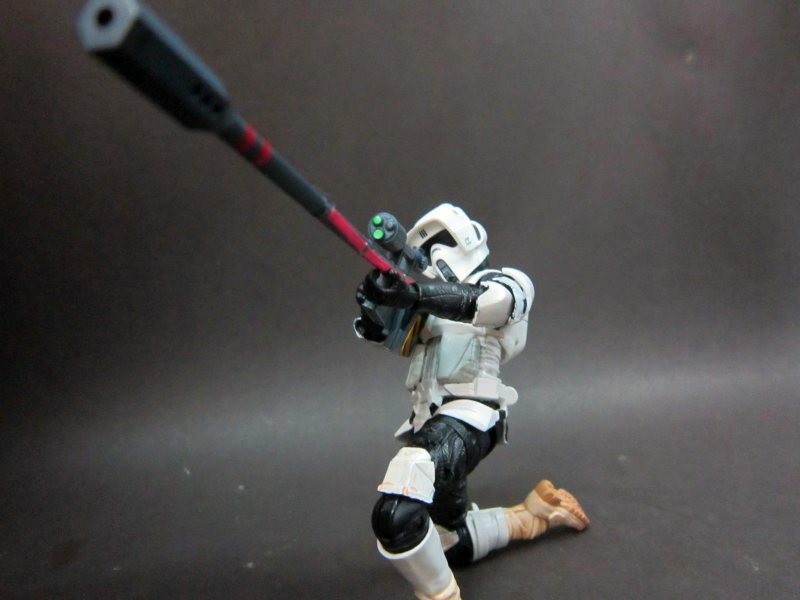 Now we know that the blaster can traverse. The flaps above the engines can be lifted, but not much. 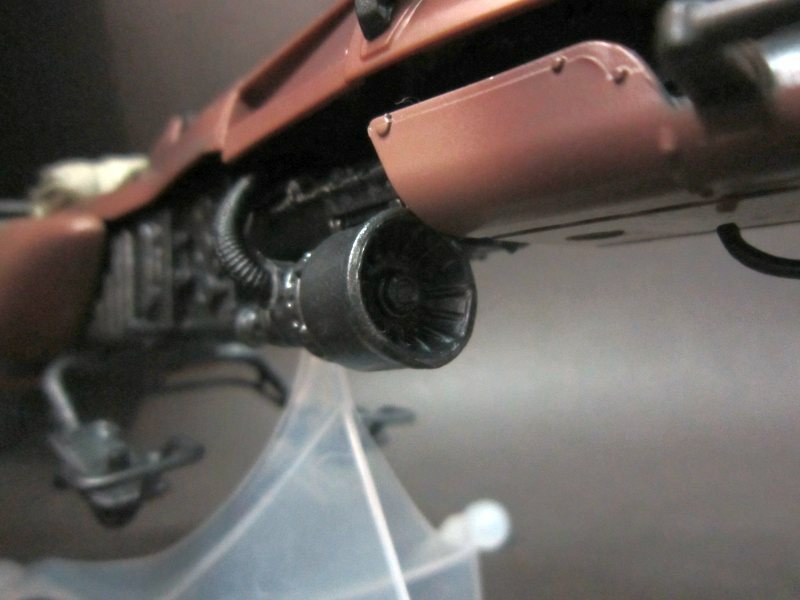 The exhaust it itself to… even if its being hidden from view most of the time, the level of detail is… wow. Even the pipes are present, and made from flexible PVC/plastic/vinyl. The button, switches, what nots. 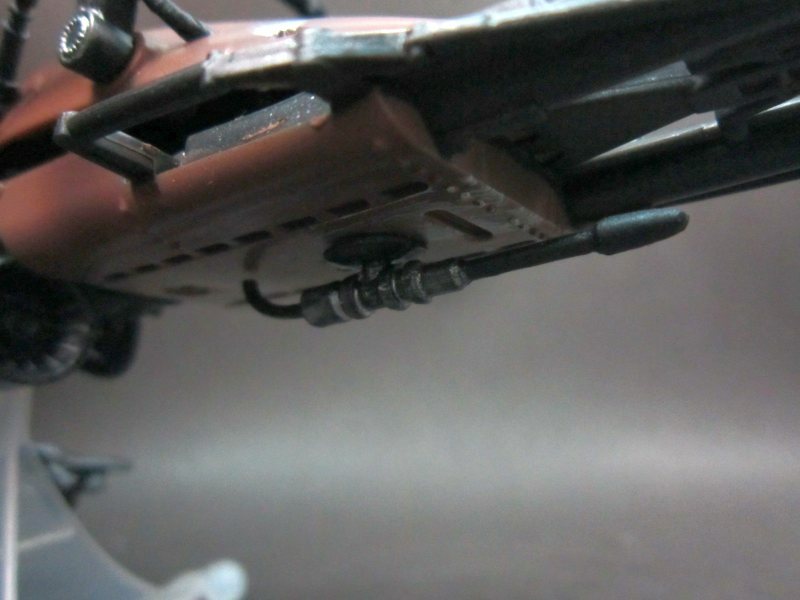 Its nice that panel has actual rivet detailing, and not just some paint. After fiddling for quite some time with his boot connection. Roughcut: THERE HE IS! STOP HIM! 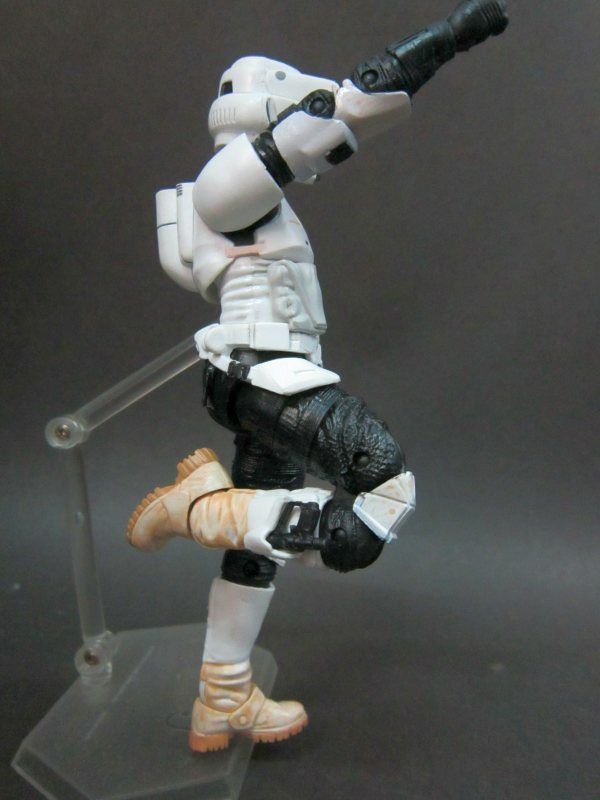 The ball-joint for the base allows some very dynamic poses to be pulled off. Is she going to be arrested? And then there was a gust of wind happened JUST when I pressed the shutter button. This is no effect, really. That is some comfy place you landed there, Roughcut. In her panic, she squeezes her legs… Trapping the poor man. Guessed they’re more happier in watching. 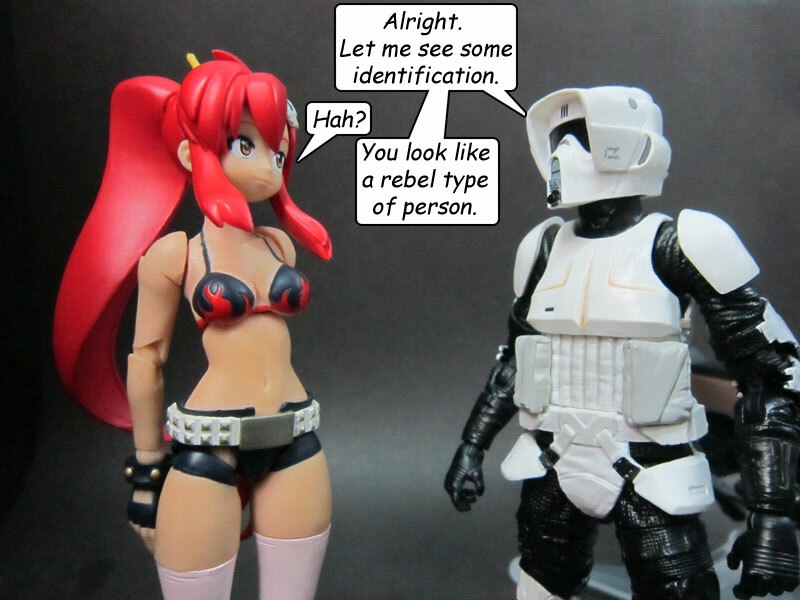 This puts him nicely into the 1/10 scale size, as Yoko is stated as a 1/10 (relatively) figure. 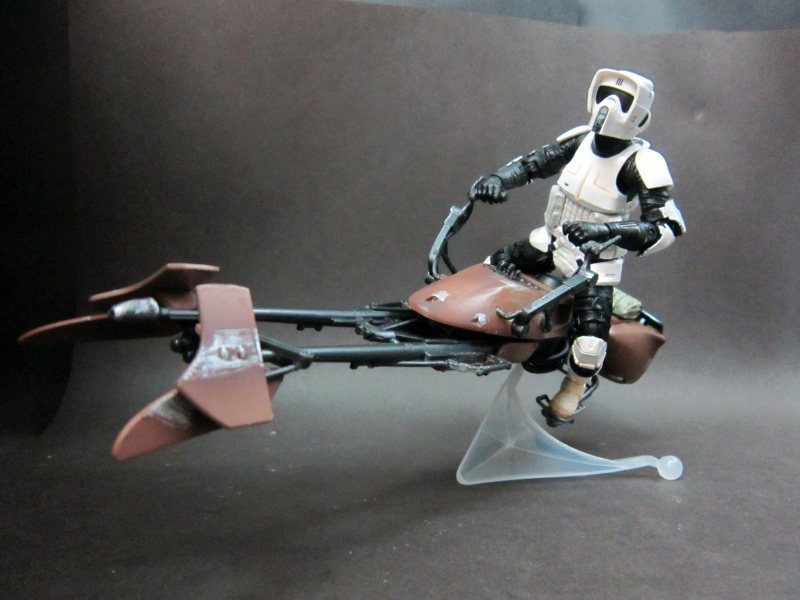 He’s even compatible with a 1/12 bike from Maisto. 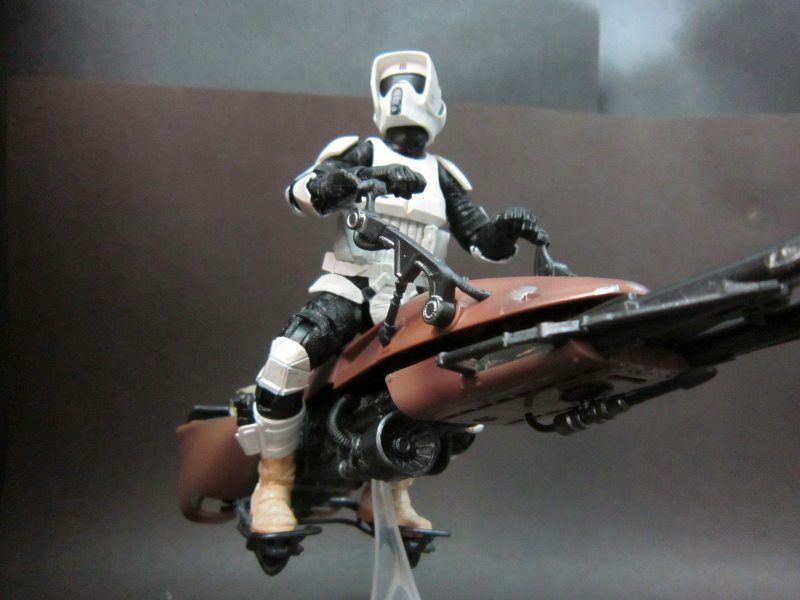 The thing is, I bough this bike last year, with no prior knowledge of this figure will come out. Matching colour-scheme, tho. Welp, better be ready for my blog’s anniversary then. See you. 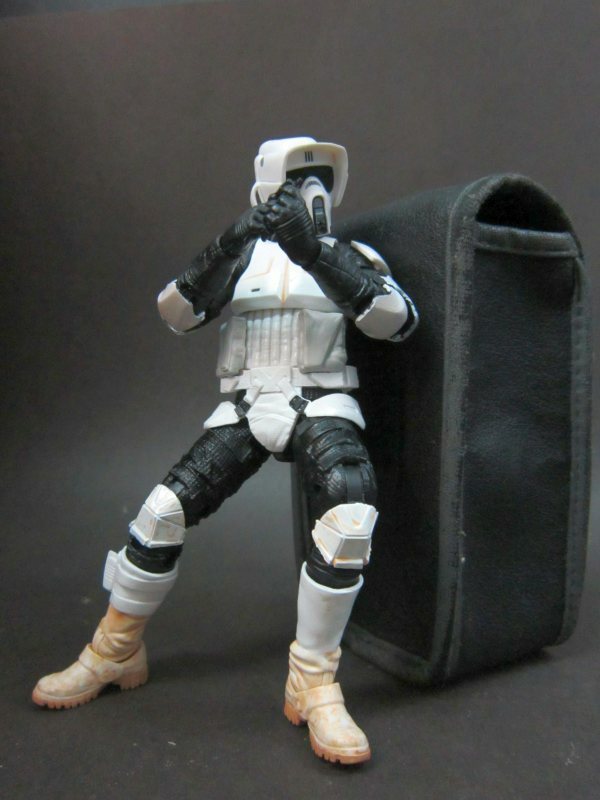 I had been thinking about picking up the Black Series Stormtrooper (non-Tatooine version) whenever it came out, but then Figuarts and Revoltech Stormtroopers were announced, so I’ll have to wait and see. 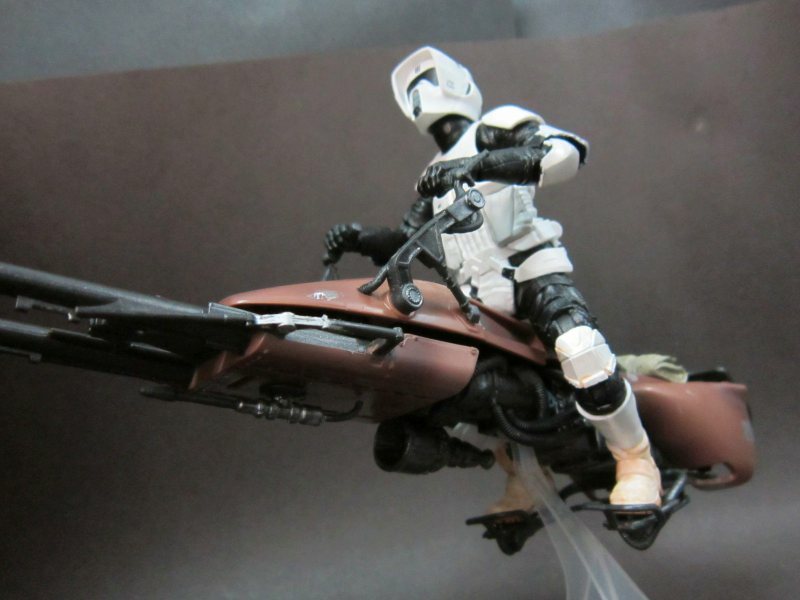 Black Series has some problems, but at least it looks like the figures in full armor are pretty decent, and how well that speeder bike turned out. Well, talk about the Stormies, I’ll be getting both makes of it. 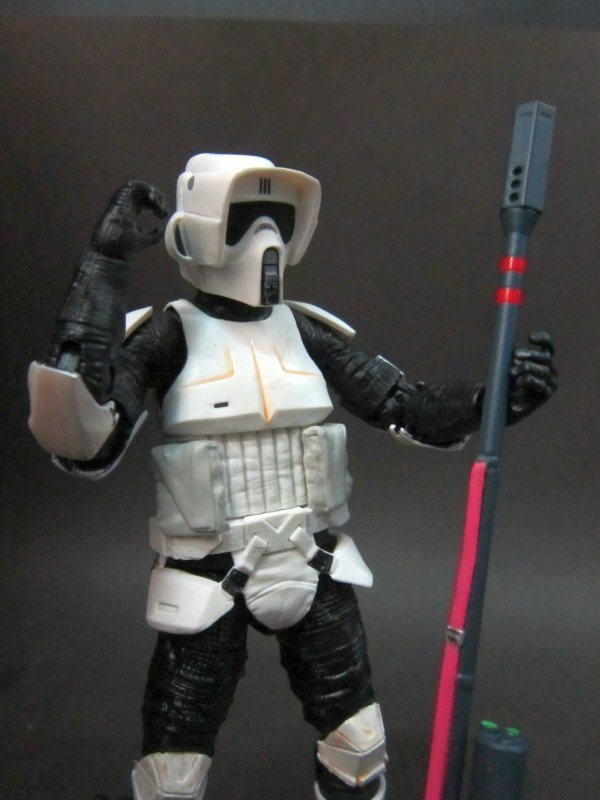 For Vader, I’ll choose the Revoltech as the cape is poseable (and not a large chunk of black plastic). The ones with human faces are mostly, misses… Mostly. Welcome back!! 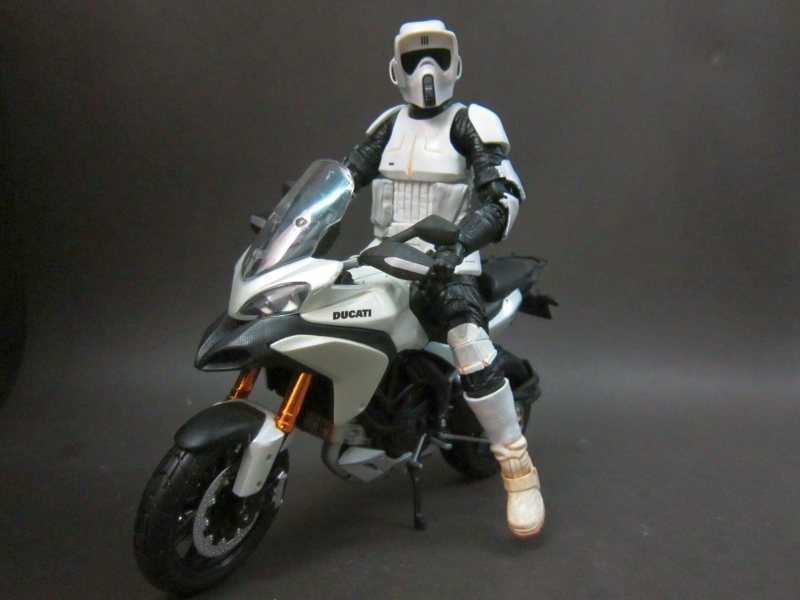 I think this scout look better with bike from Maisto! Great figure!